-look for my product, if you see the words “NEWLY REVISED RE-DOWNLOAD” this means I have a newer, better version.. There is no need to re-purchase the product for the updates, simply click on that link and you’ll get the latest version! Thank you!! “the faster a given object is moving, the more energy it possesses”. 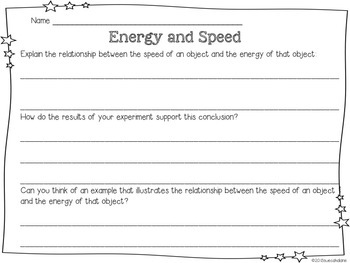 4-PS3-3: Ask questions and predict outcomes about the changes in energy that occur when objects collide. 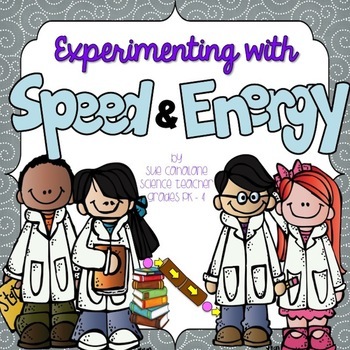 Have your students study the relationship between speed and energy and see energy transfer right before their eyes! Materials needed: large 2 centimeter marbles, small irregular shaped objects (example: rock, plastic toy, etc), paper or paper towel tubes, textbooks, rulers or meter sticks. I have my 16 students form 8 groups and each group creates a ramp using a stack of books or a box- anything we have in the classroom to prop up a tube. They create a tube tunnel and experiment with marbles and irregular shaped objects – what happens to speed/energy when we have a steep ramp? What happens when we lower the ramp? 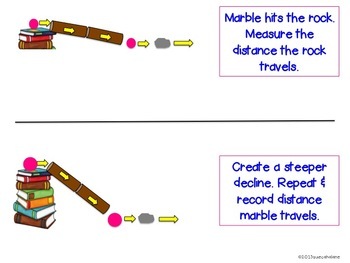 Can the marble transfer energy to an irregular shaped object? How far will the object move? 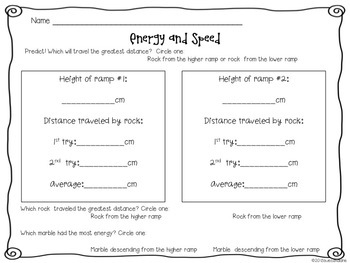 This is such a fun and easy way to illustrate the relationship between speed and energy and energy transfer. Your students will be able to do this entire lab set-up by themselves, record data as scientists do, and draw conclusions based on their results. Please note: these units are for the use of one educator. If you would like to share my lesson plans with a co-worker, your team, your school, or your district, please purchase multiple licenses which are offered at half price. When you click “add to cart”, please also click on “ buy licenses to share” and then enter the quantity of half-price licenses. Thank you so much! !